For the incoming class of 2020, the Clinton and Bush families have always campaigned for something major. Vladimir Putin will always be, in power overseas, eBay will always be an online swap-meet, and the United States will always be at war. These people are members of Generation Z and were born between the mid-1990s and early 2000s. 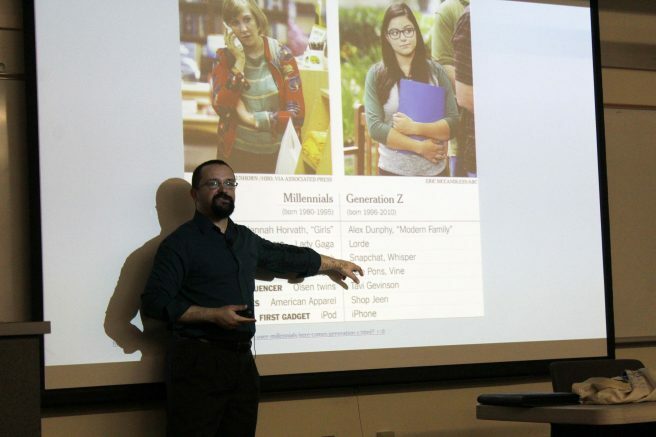 At an American River College College Hour presentation on Sept. 20, Dean of behavior and social sciences Carlos Reyes went over the defining traits of many preceding generations—such as the Baby Boomers, Millennials and Generation X—in order to present the unique themes present throughout the current Generation Z. “Whenever you do a generational analysis, a couple of problems always come up,” Reyes said. According to Reyes, overgeneralizations and stereotypes should be acknowledged as inevitable to a degree so that summarizing the themes of the aforementioned generations can be made possible. Generation Z is starkly unique compared to its predecessors; whereas access to information has reached an unprecedented conveniency, websites on the rise such as Snapchat and Whisper are an insight into how important it is that what is seen will disappear just as quickly. Unlike Facebook’s explosive expansion during Millennial years, Generation Z would rather not have a mistake documented online in any permanent capacity. Along that same theme, Reyes said that “Generation Z takes in information instantaneously and loses interest just as fast,” quoting the blogger Hannah Payne. The people who make themselves famous on those mediums and others, like YouTube, tend to be who Generation Z idolises according to Reyes. Reyes included an anecdote in which he referred to famous YouTuber PewDiePie’s scandal, when he was accused of failing to disclose endorsements for his video reviews of various games. According to Reyes, an interview from CNN, NBC or Fox News would be a chance to prove one’s legitimacy in the past—for people like PewDiePie however, who rejected offers for interviews from various major news networks in favor of releasing a response on his own platform of content, that isn’t true anymore. While not everyone can start their own successful brand, it’s further proof of the fascinating nature of Generation Z; now more than ever, it’d seem they’re mirroring their grandparents’ or parents’ more conservative general mindset, wanting control over their own information and moreover, their own lives. Be the first to comment on "Defining Generation Z"